This blog is ONLY just over 3.5 months, but I find myself obsessed with figuring out if I am contributing to any networked learning. Scott McLeod has written about “measuring” the impact of a blog and I commented that I’d like to consider some combination of comments/post/reader and number of pingbacks. In other words, I will feel like my blog is useful/valuable if it is generating discussion. People may come and learn by simply observing, but I don’t feel like that’s enough. So, three months of posting and never more than a handful of comments on any one post and a Technorati authority of a whopping 22. That’s not at all bad for a baby blog, especially considering I’ve done NO marketing of my blog other than claiming my blog on Technorati and including the URL in my digital e-mail signature (this despite being a regular reader of Seth Godin’s blog). Oh, and my arrival on the Twitter scene probably gives me some small amount of exposure. Yet, yesterday, I wrote about “technological doping” and linked to a CNN article about technologically advanced…bathing suits. That post, in one day, has been viewed 4x as much as any other one post ever on this blog and generated about 4x as many comments. Why is this? Is it something about the post or am I somehow just generating more traffic as a natural maturation process? I don’t have answers yet, but I have a couple of hypotheses. First, perhaps linking to something as grand as CNNbrings traffic? Second, I don’t “know” the commenters and they don’t appear to from the ed. tech. or ed. leadership arena. So, did I tap into some niche where there’s more (or less) conversation? I think where I’m going with this is that I worry that the ed. tech. blogosphere is reasonably saturated. Related to Darren Draper’s post on Twitter Set Theory, I feel like there are some central figures whose spheres overlap considerably and a whole lot of us outsiders trying to penetrate that inner circle. It’s as if folks like Will Richardson, David Warlick, Wes Fryer, Vicki Davis, Dean Shareski, Stephen Downes, Chris Lehmann…(and, yes, you Scott) are having an awesome cocktail party conversation and I’m standing on the outside staring over their shoulders and listening in, trying to get a word in, but not penetrating that conversation at all. I know there are LOTS of us on the outside looking in. I don’t even want to imply blame at all; those folks are not doing anything wrong. I just wonder if there’s a saturation point for social/professional networks. For those interested in collaborative, networked, Twitter/blogosphere/Ustream-driven learning specifically about ed. tech. matters, is there a need to listen/read much more than what they can get from the occupants of that inner circle? Anyway, Scott asked me today if I’m enjoying this blogging thing. The answer is a definitve “yes.” There’s something cathartic about it and validating when I do get even a few comments or a pingback (did I mention that Eduwonkette linked to me recently?). 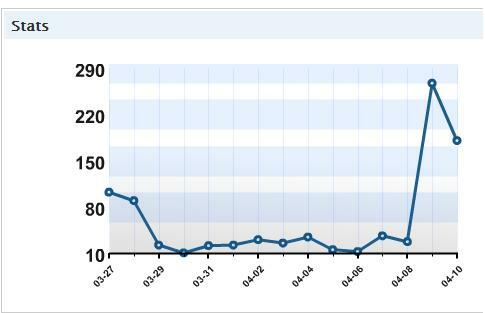 My academic article in an open access, peer reviewed journal has been viewed 1,257 times since Feb. 2007. My post yesterday was viewed by almost 400 people in one day. That’s exciting and I’m looking forward to more and more of this (especially after I get tenure). This entry was posted on Thursday, April 10th, 2008 at 7:24 pm	and is filed under blogging, Ed. Tech.. You can follow any responses to this entry through the RSS 2.0 feed. You can leave a response, or trackback from your own site.